Sometimes a movie comes out that changes everything. A movie so earth shattering that you are forced to re-evaluate your entire life. These movies are so rare that we must cherish them and walk away pondering their insights. Kickass 2 isn’t one of these movies. In fact, it’s nowhere close to being one of those movies. Even though I won’t be making any major life altering decisions after seeing Kickass 2, that doesn’t mean I didn’t enjoy it. Kickass 2 is exactly what it set out to be: an edgy tale of real life superheroes who truly don’t have any clue what they’re doing. 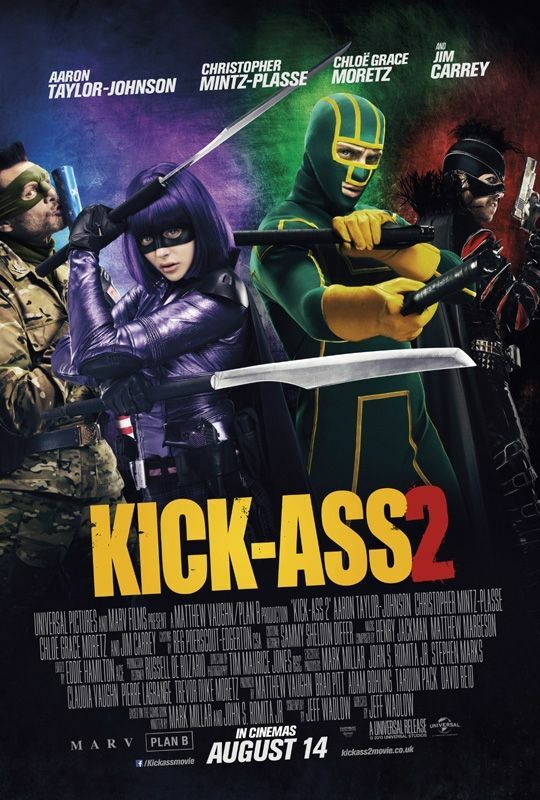 A sequel to 2010’s Kickass, and based on Mark Millar’s comic of the same name, Kickass 2 picks up after the events of the original. Kickass, the main character, is in retirement and Hit Girl is underground, though still training and preparing as if she weren’t. Much of the film deals with Kickass as he finds and joins a team of superheroes, all of whom are inspired by the actions he has taken as the world’s first superhero. There is almost a demented Avengers feel to the movie as the team is introduced, playing off the traditional comic book story of assembling the new team to fight a big threat. The plot fits within the already established world, but, like the first one, it’s still a bit farfetched. One scene in particular with supervillian Mother Russia really pushed the limits of what is believable. She manages to take out ten police officers in some particularly bizarre methods without so much as a scratch to herself. There have been many great movies (like The Matrix) that push the limits of the believable, but they tend not to be set in the present day reality. Certain elements of the movie, such as the training sessions, although exaggerated, were believable; while others like the attack on the poker game were over the edge. The action sequences provided a pleasant mix of choreographed fights and clever dialogue which moved the story forward, without an excessive amount of shaky camera work and without going too crazy with the gore. The first Kickass was as much about trying to shock the audience as it was about the story. This time around most of the serious violence was saved for the major fight at the end of the movie. There was, of course, some included throughout the movie, but not quite as much as Kickass. Also, the blood and violence was considerably less cartoonish. Speaking of the final fight scene, Kickass 2 had a nice comparison between the supervillains all dressed in black and red and the superheroes who were in a whole rainbow of different colored costumes. Although a bit obvious, it did make things clear who the villains and heroes were. As far as the actors go, I enjoyed almost every performance. Aaron Taylor-Johnson plays a very believable geek but was able to get in fantastic shape for this role. Talk about making people feel inadequate; he has muscles I didn’t know existed. Recently Kickass 2 made news even before it was released due to Jim Carrey’s criticism of the violence in the film in the light of Newtown, CT. Carrey’s performance in the movie was respectable though not excellent. He was good, but I think his statements after the fact overshadowed the performance. The standout performance of the movie has to go to Chloe Grace Moretz as Hit Girl. She was good in Kickass, but she was even better this time around. A very talented 16 year old, Chloe was really the driving force behind the story. Although the story is about Kickass and is told by him, as times it seems like a Hit Girl story with bits of Kickass thrown in the middle to break things up. While I loved seeing Hit Girl beat the crap out of Kickass in an attempt to make him tougher, my favorite scene involved her getting even with the school bullies in an incredibly fitting way. Overall there wasn’t anything specific I didn’t like; it’s just a second tier superhero movie. When compared to the original movie, Kickass 2 is a considerable improvement. There is a much more cohesive plot line, which is a result of the source material being completed well in advance of the movie (Due to health reasons, Mark Millar had to delay Kickass the comic significantly and the last issue was released at almost the same time as the film, leading to the plot of the movie being fuzzy at times.). Kickass 2 proved to be just about everything I look for in a sequel. It gave us further character development; introduced new and interesting characters, both good and bad; and most importantly it wasn’t just a pure rehash of the first film. If you really enjoyed the first one, then check out Kickass 2 in theaters. Otherwise, it’s worth the wait for Redbox. I give this movie 3.5 Death Stars. Good review. Nowhere near as good as the first, but it was okay for a superhero flick nonetheless. Could have done better with a more evened-out tone, though.